Ben Sutcliffe-Davies has more than 35 years’ experience in the marine industry, including boat building in timber, GRP, steel and aluminium. An accredited member of the Yacht Designers and Surveyors Association (YDSA) and an associate member of the International Institute of Marine Surveying (IIMS), he is also a full member of British Marine and the Inland Boat Builders Association. OVER the years positioning of gas lockers within steel canal craft has changed for the better on the whole. It certainly has needed to with the changing qualities of steel and as builders have understood the importance of longevity. 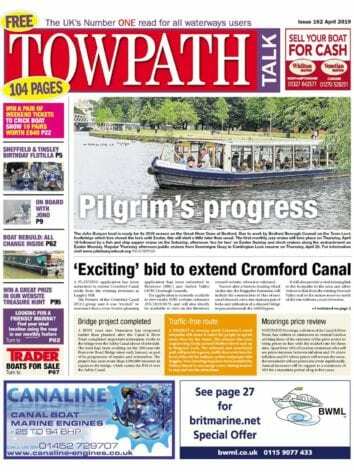 Ironically, on GRP craft many of the problems I’m covering in this article don’t exist in quite the same way purely because of the materials used – however, some of the location issues are the same. With steel craft the obvious and biggest problem is that the lockers will, regardless of position, suffer from corrosion. Several of the typical causes are more noticeable in early craft where the gas locker has discharges on the craft’s water line, either in the bow or the stern production, which allows a constant flow of water in and out. On some craft I’ve found more than 4in of river silt building up within the base of the locker only because the locker base was well under the craft’s designed waterline. Regularly the highest areas of corrosion build-up are where steel is constantly exposed to the wetting and drying effects. Even with gas lockers well above the water line this can happen from just the outside of propane bottles ‘icing’ when in use in cold months. So what to check… it’s well worth at least twice a year lifting the gas bottles totally out of the lockers, say, when changing the empty cylinders and ensuring the locker base and sides are clean, dry and well protected. If in doubt get a hammer and hit the plating in any areas of obvious corrosion. If the metal starts to bend it’s clearly under 3mm thick and on the way out. Look at where the discharges are and ensure they are clean and clear and allow gas or water in the locker to flow directly overboard. 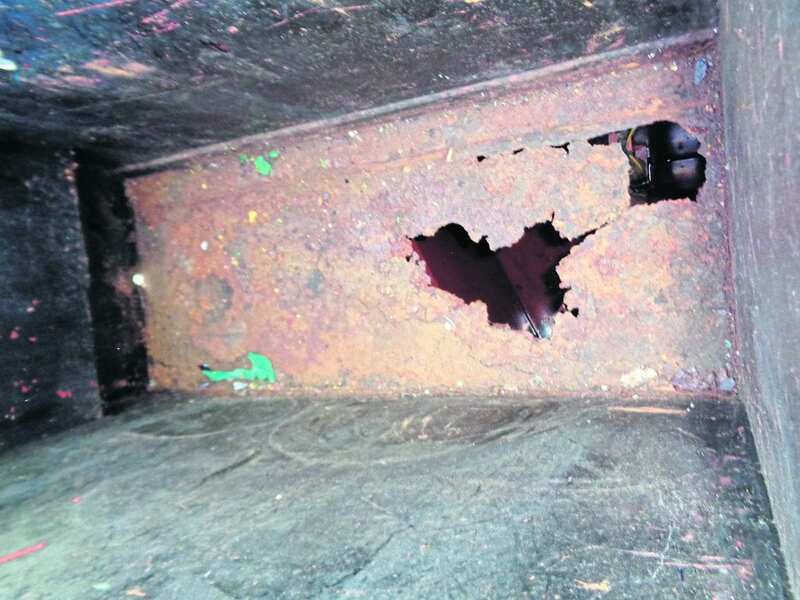 On one recent survey the locker was nicely positioned up on the cruiser stern, which in many ways was great; however the drain in the base wasn’t actually connected and any gas fumes could have drained directly into the engine compartment. One of the best methods to check the integrity of a gas locker when it’s above the water line is to get a bucket of water and chuck it in the locker. On my YouTube account you can see several failures of this simple and basic test! Try to avoid direct contact of the gas bottles with the steel plating. Using PVC or rubber battens will help allow any water to free the area. Ensure the base and sides of the locker and, if accessible, the undersides of the plating are clean, dry and properly coated with a good quality tar. Check that any gas fumes would definitely flow overboard and have no way of flowing into the accommodation or engine compartment. It’s worth also ensuring that the locker is never physically padlocked. I’ve attended several fires where the lock prevented quick removal of the gas bottles by the owner, but it is worth ensuring the bottles have a simple means to be secured within the locker. Check that the dates of any of the gas hoses on board for locker feeds and appliances are in service date; most are clearly dated and should be changed at least every five years if they are the orange rubber hoses. Many owners don’t realise even hoses that look okay can become porous and for what costs a few pounds to change should be a complete no-brainer. 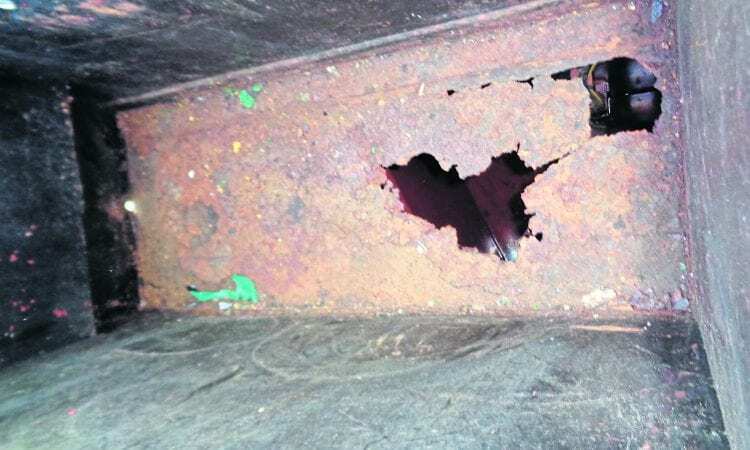 Next Post:What’s in the bottom of your fuel tank?